Books can be a wonderful learning tool and great fun at the same time! 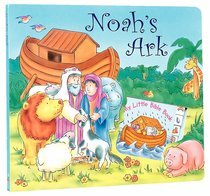 This delightful interactive storybook introduces children to the timeless message of the story of Noah while teaching them that they can discover fascinating things for themselves. Ages 1-4. This interactive learning book introduces well-loved Bible stories and helpshildren discover they can find things out for themselves.